The airwaves are full of memories about rolihlahla Nelson Mandela. The same words, over and over. The boxer, who became a lawyer, who became a freedom fighter, who became a prisoner, who became the leader of a nation and a moral example to us all. So many people ask: Did you ever meet him? No. But, yes, in a way. I never had the honor — and great pleasure so I’m told by those who’ve met Mandela. They talk about their knees buckling, their mouths going dry, and whatever cynicism wilting in the warmth of his smile and laughter. I came close. My story takes place in 1993, 20 years ago. 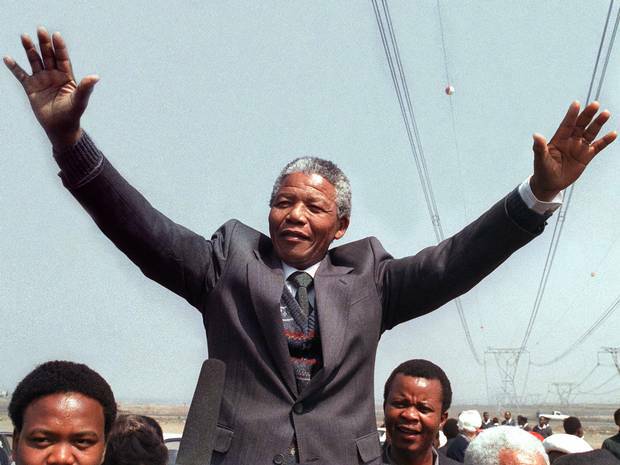 It’s been more than three years since Mandela walked out of Victor Verster Prison east of Paarl. A lot more people died from violence during those three years before the first truly democratic elections in 1994 than had been killed during the previous thirty years of “armed struggle”. The government had hit squads and secretly armed groups that wanted their own white or tribal “homelands”. They would’ve torn the country apart. It was a pressure tactic, a gamble to gain advantage at the negotiation tables that some people, even those in then-President’s office, thought worth the risk. People died from bombs planted in bars and nightclubs. Dozens of people died from drive-by shootings at crowded taxi stands. More people died at the hands of gangs of hostel workers that roamed surrounding townships to murder and inflame. Disrupt with random killing. Get people to believe that “black on black” violence was the future with Mandela and the ANC. Push the delusion that a return to the past – or some bizarre version of that past – meant peace and stability. Violence begat revenge and more murder. South Africa was on the brink of civil war. Mandela warned about a government-backed “third force”. The media tacked on the word “mysterious” but we all knew there was nothing mysterious about it. This willful blindness penetrated Mandela’s deliberate calm. He’d explode in anger when reporters questioned the “third force”. It was like doubting the existence of air. You couldn’t see it or touch it but it was there. Why couldn’t these reporters understand? My co-trainer, Tim Knight, and I go to hear Mandela speak to foreign correspondents at the top of the Carlton Hotel in downtown Johannesburg. There’s a table at the back of the room but not far from the elevators. We might catch a glimpse of Mandela when he enters. We’re late but so is he. A half hour and more goes by. We’re told he’s in a meeting about setting up a truth and reconciliation commission. We decide to grab a quick puff near the elevators. There’s a buzz over there and a big security man so we stick near the entrance. The doors open and Nelson Mandela emerges surrounded by more big security men. He’s about 40 feet away. All I need to do is stay there and I’ll meet my hero. He’s nearly 45 minutes late. People are trying to rush him along. But there’s a tiny lady halfway down the hallway. A lady wearing the almost universal uniform of cleaning ladies in South Africa. Light blue smock. Light blue cotton beret. White bib and coverall with ties in the back. She’s old and slight and very precious. She backs against the wall as Mandela’s entourage approaches. Looks down at the carpet. Instead of passing by though, Mandela stops right in front of this tiny lady. He turns and takes a step toward her. He says something. Her head rises. Her face lights up. I can almost see her knees buckle. He reaches out and puts her hand in his. Behind him, big anxious men shuffle. He’s late. Very late. There’s a room full of important foreign news people waiting. He must know this. Those big men certainly act like they do. But Mandela is in no hurry. He takes his time to treat this tiny woman like royalty, like family. I’m uncomfortable. He’s not playing a part or performing for the cameras. It’s a private moment. It’s spontaneous. Genuine. He reminds me of the elders back home. Not the poseurs that I dismiss as “old farts”. But real elders. People who shine from within. We turn and go back to our table. After keeping his audience waiting for nearly an hour, Mandela’s speech is angry. He’s the politician again. The war chief. He accuses the government of cowardice, of secretly funding and arming gangs that are killing his people. He lectures the foreign media for giving credence to rumors of “black on black” violence, like it’s genetic and natural for Africans. It’s political violence, he pounds the podium, designed to kill peaceful negotiations at power-sharing. This is the old war horse. The lawyer. The boxer. The fighter. Nope, I never met the man. But I feel like I did.